I had a secret agenda for the mini delivery of the Karen Marie from Jamestown to Essex; the plan was to bring my brother along both for the extra pair of hands and to plant the boat ownership seed into his subconscious. Standing at the wheel, soaked to the bone, wind burnt, and shivering on the first leg, I was fairly certain I had succeeded in sending him running for the hills. “You’ll want to bring a couple books for the ride, and don’t forget your bathing suit,” I texted him days before our trip. A wetsuit would have been more appropriate. The crew in calmer conditions. Our trip started ordinarily enough. Egg sandwiches, hot coffee, naps and snapping pictures highlighted the first couple hours of the journey. Rounding Point Judith and turning into 2- to 3- foot chop, and 20 knots of wind flipped the switch on all that. It was the most miserable time on a boat that I’ve ever experienced. We were pummeled for hours–which felt like days–until we found the channel to Stonington, CT.
After finding our mooring, we took to the next tasks at hand: hanging sheets, pillowcases and clothes on the lifelines to dry while enjoying a few well-deserved adult beverages. In short order my once-proud classic yacht took on the appearance of a homeless shelter. Once on land, hot showers and dinner at the marina restaurant, Dog Watch Café thawed our cold and clammy crew. After a nice meal, Karen, Ryan and I opted for a peaceful nightcap out on the restaurant’s back deck before calling it a day. This was going to plan just fine until we spotted an adult Jenga set. (You know, the game where you pull blocks from a wooden tower until it topples over, but this one was much bigger.) Now if you know my brother and I, you know we’re what some people call “stupid competitive.” Video games and bike rides in our younger days turned into more brawls than my parents care to know about. So it shouldn’t come as a shock to learn that our game attracted a crowd of onlookers who critiqued each move. Yours truly won the game and no bloody noses ensued; so we can file the night away in the win column. Leg two from Stonington to Essex was drier that our first leg, but man was it cold! Combine 45 degree air temperature with sustained 20 knot winds on the nose and throw in a splash of salt spray and you have a recipe for a very long morning. Double socks stuffed into Sperrys and towels doubling as blankets made for rather unique fashion statements. After hours of sitting on our hands, we finally made our way up the Connecitcut River. Lighthouses, a pair of bridges and plenty of boat traffic provided a lot to look at after spending so much time in the middle of the Sound. Finally appearing off our bow, the quaint town of Essex appeared like a postcard from a small Maine village. Frown lines from cold crew morphed into wide grins after tying up to the mooring. High fives all around signified a successful end to the trip. Long naps and hours of leisurely reading may not have come to fruition on this delivery but few memories worth making ever started with “remember that time we went swimming after a peaceful passage?” I’m sure this trip will be something we all remember for a long time. See you soon, Castle Hill. The small village of Stonington offered numerous attractions and many highly-rated restaurants. Easily entertained this one is. Narragansett Bay was exploding with activity. The sound of blaring horns and the Star Spangled Banner provided the soundtrack to which hundreds of boats of all shapes and sizes crisscrossed one another at high speeds. I’ve seen this level of nautical pandemonium before but it’s typically reserved for the fourth of July. 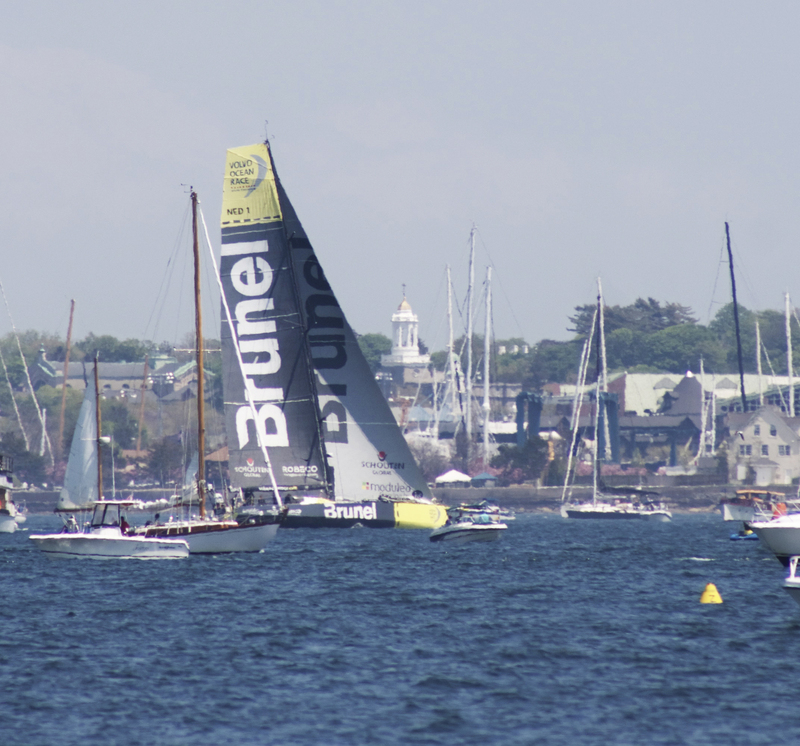 The day’s pomp and circumstance was caused by the departure of the Volvo Ocean Race—a grueling around the world sailing race—from Newport. Watching all these boats, many of which were launched early for the sole purpose of seeing these sailors off assuaged any doubt as to whom the title sailing capital of America truly belonged to. It took steely determination to not crack a cold one, sit on the dock and watch the VOR boats cut and jibe through the crowd. But just a day out from launching, Karen and I were forced to return to the ever-growing to-do list. From loading provisions, prepping the dingy, attaching the mail sail and tending to lingering brightwork, our plate was full. And let me tell you, chores like sanding a toe rail (again!) or fumbling with the tiny clasps that attach the sail to the mast never seem as monotonous as when hundreds of people are out having a blast just yards away. I felt like that kid who has to sit in the library and study while all his friends are out on the town. A few cold glares from Karen would shake me from my daydreams and send me back to the tasks at hand. Together we cleaned, prepped, organized and got the Karen Marie ready for to launch. By the time all the work was done the harbor had become quiet once more. The boat traffic transformed into a parade of cars fleeing from Newport. Before joining the procession, we stopped at Spinnakers in Jamestown for a couple scoops of ice cream. Nursing a cool cup of mint chip, I realized that despite an incredible difference in skill and craft, Karen and I weren’t so different than those Volvo Ocean Race sailors. We both came to Newport from a distant land, and had no idea what to expect. 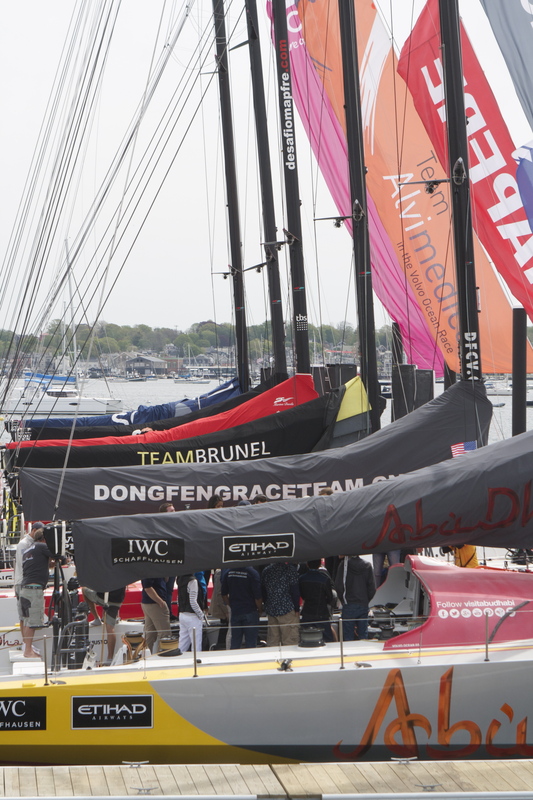 We were treated to world-class hospitality and in the end, leaving Newport for another adventure is bittersweet. Next weekend, as the Karen Marie heads passed Castle Hill there won’t be hundreds of boats to see us off, no horns will blare and the Star Spangled Banner will be coming from my iPod instead of Fort Adams. But one thing is certain; for us it will be no less special. No matter what day of the week it is, whether its a warm and sunny day or if it’s bitter cold and raining, in the summer and fall, there will be boats out racing on Narragansett Bay. On this night, it was a fleet of J-24s that whipped up the water. Competition was fierce, it always is, and at the end of it there were no trophies to be had, no sponsorships waiting for them at the finishing mark; the only reward was wind burn on their faces and salt spray in their hair. After a race like that, there is a winner but there are no losers.